My next big feature isn’t ready yet, but I’ve prepared a new build with a ton of minor improvements, bug fixes, and miscellaneous additions…including a new cassette tape! Keep in mind that this is a rough work-in-progress and that the end result is going to be more polished! There are a few other things I’d like to do with this blog post. First up: a poll! Which of these are your favorite Yandere Simulator characters? You can pick multiple options! The results of this poll will determine something that will happen in the future, so please vote honestly! Next, I wanted to mention that Kjech, the artist who drew all of the artwork for the Characters section of the official website, is now accepting commissions! 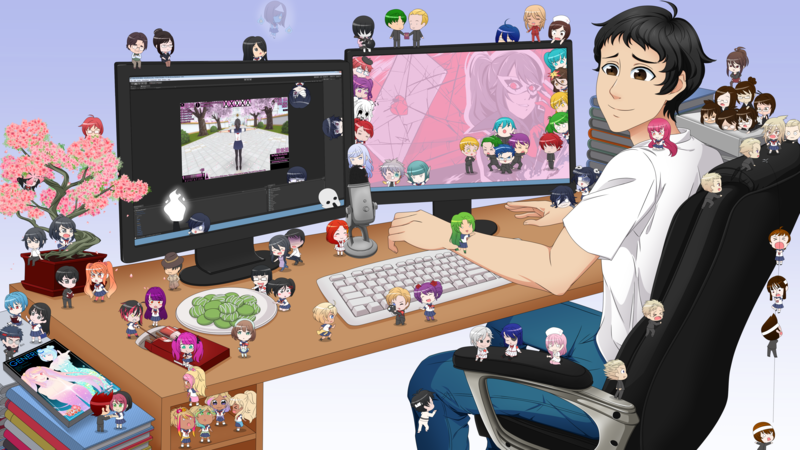 So if you’ve always wanted the artist of Yandere Simulator to draw artwork for you, go check that out! There are a couple more things I’d like to share with you today! To see those things and also see a list of everything that is new or different in the latest build, click “Continue Reading”! It’s the 1st day of a new month, but I don’t have a new video or a new build prepared just yet. Instead, I’ll give you a preview of some content that you can expect in the near future! Hmm…what could this be about? You’ll find out soon enough! Click “Continue Reading” for more previews!